Meet your guide at your hotel in the Punta Cana area between 6 and 7 a.m. Ride on a comfortable bus for roughly an hour to the town of Las Cañitas, passing through the countryside and along the coast as you go. Upon arrival at your destination, board a catamaran for a 30-minute ride to Samaná. Restrooms, soda, and unlimited rum are available during this transfer. 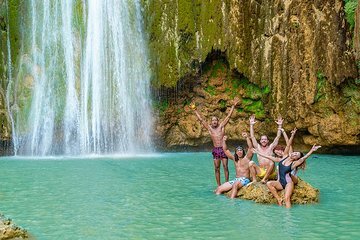 When you arrive in Samaná, jump on a safari truck and drive to a 2,100-foot high mountain top (640 meters), followed by a 30-minute horseback ride through coffee and cocoa farms en route to El Limón Waterfall. Eat lunch at the base of the falls and enjoy the view. Then, head back down to Samaná and over to Cayo Levantado (also called Bacardi Island), where you can swim and relax during 90 minutes of free time. Return to your hotel by 7 p.m.